Horse Feathers, another in a collection of great bands filling up the scene in Portland, Oregon these days, is largely the creation of its founder, Justin Ringle, who along with Peter Broderick has created a warm, simmering sound of rustic Americana and folk traditions. Their newest album, House with No Home, is another fantastic collection of their music. AD sat down to talk with Justin Ringle about his formative years in Idaho, how technology may be erasing regionalism, and just how thrilled his teenage self would’ve been that the band is signed to Kill Rock Stars. 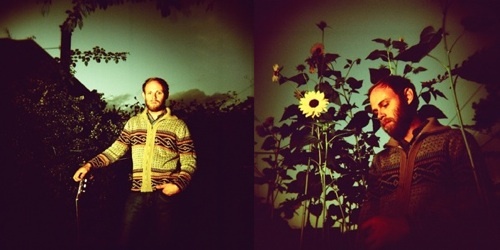 Aquarium Drunkard: The band is based out of Portland, Oregon, but you grew up in Idaho. What is Idaho like, for those of us who have never been there? And what kind of affect did growing up there have on your musical maturation? Justin Ringle: Firstly, Idaho as a place is kind of a Western mountain state and, in a lot of respects, it’s pretty desolate, pretty low-population density, pretty wooded. I grew up in a town of about 20,000 people which was the biggest city in the area I lived in. I grew up battling a lot of boredom, and that’s what started me out writing songs. It was that or get into four-wheel drive vehicles or hunting. So I kind of picked up a guitar and it was just something to do in a place where there really wasn’t any culture. So I started to write music, playing and singing guitar and, I’ve lived in Oregon now for about four years, but I definitely learned a lot more from living in Idaho than I have from living in Oregon. It’s had a much greater impact on me as a musician. AD: Where did your musical influences come from in that environment? JR: Growing up, the things that were easiest – regionally there was a lot of indie-rock I grew up listening to – stuff from Seattle, Olympia and Portland – that was the stuff easiest to see live. But there isn’t any type of music that is indicatively Idaho or would represent Idaho. It was more a fact that there was an absolute lack of culture there that forced me to get deeper into music and forced me to spend a lot more time listening to it and forcing you to be a little more introverted because there really is nothing there. Unlike a place like Portland where there is an overabundance of music. Idaho has a lot to do with space and is kind of desolate which, funnily enough, I’ve only appreciated that now that I’ve moved away. When I lived there, I hated it. Living in Oregon now, I appreciate my time living there and the type of quiet lifestyle you have living in a place that is more rural. Oregon has influenced me as well, but in a different way. JR: You know, when I first started to really get into music, it was right when the internet was starting to play a role in that. When I was in high school, if you didn’t have a mail order catalogue to some label, you were out of luck. So, before I could even drive, I would beg my parents to take me to Seattle or Portland to buy records. When I had my license, we would drive 6 hours to Seattle or Portland to see a show and get back in the car and drive home to make school the next day. We were pretty far from anything. There wasn’t a whole lot to do where we grew up, but I think it was that commitment to wanting to listen and search things out. I wouldn’t trade that. AD: You hear a lot of things about artists who grew up in remote or removed evidence, fashioning their own sense of what music should sound like based on their limited resources. Are we going to see those same unique things? We’re having this sort of homogenization of culture thanks to television and the Internet. Is that going by the wayside? JR: I think it is. This is a conversation I’ve had with my friends for some time. I think with the cost of gas over the last couple of years, I think it’s out-priced a lot of bands from touring. And I think a bunch of this – I’ve always kind of crossed my fingers that might happen so we might see more regionalism in music. Bands that stay more regional rather than touring the country all the time. That’s something I saw a lot growing up in the Northwest. I wasn’t right next to the epicenter, but all that stuff to me was really important. All the regional music was what I listened to first and foremost. It’s almost a shame that a band is owned by the world the moment they put stuff online. I kind of wish it wasn’t that way because things are so exposed over night that it doesn’t give time enough for that individuality and originality to really take hold. I think people already, out of the gate, they’re listened to and, I don’t know, the internet is a bizarre thing in that kind of way. AD: When I was reading things about the band online, a particular reviewer mentioned as touchstones Springsteen’s Nebraska – which is mentioned for so much of the music that runs in the style that you guys play – all the way over to Max Richter, this German, post-classical guy who does these almost environmental type pieces. Can you talk a bit about the non-traditional influences on your music? JR: It’s interesting. Basically, I personally am not as influenced by Richter, but the string players I play with, Peter and Heather, are definitely influenced by a lot of that stuff. And I think that what we’re doing, the sound on the record, has a lot to do with the songwriting I’m bringing to the table meeting the arrangements of Peter and Heather. I’m more into the words part of it. I bring the verses and choruses and see what they come up with. They’re very influenced by the mood of a lot of that new-classical type music. So that’s part of the collaboration that happens with the group – the different influences that each of us brings. AD: Do you have a separate set of lyrical influences from musical ones? JR: Definitely. I’m influenced by books – or by writers and poets – not exclusively. I think a lot of the lyrics are definitely – as far as subject matter – are shaped by personal experience. I’m appreciative of lots of authors and poets – those are my two biggest influences. My own life experiences and books and literature. I won’t say I’m too indebted to it. I won’t say my lyrics are incredibly literary – some people are really very that or try to attach themselves to it, but I’m not trying to subscribe too much to anything. A lot of times mine are sometimes more stream-of-conscious, based on life experiences but fictional. AD: The new album is called House with No Home – can you tell us about the title? JR: It was kind of inspired – going back to the idea of personal experience – I had felt once I was finishing the record or during the process of it, that a lot of the songs had this theme of being in an uncomfortable place. Looking at the songs and the way they made me feel when I wrote them, I came up with the title. It’s a lyric on the first song on the record, “Curs in the Weeds” and that just described the record for me. I liked the ring to it and I just responded to it in some way. I think it’s an apt title. AD: The album includes the notion of a reprise – you have a reprise of the song “Father,” which is actually the last song on the record – but this reprise comes in the middle of the album, almost like a teaser of musical themes to come. People are used to seeing that after a song – what was the idea of having it in the middle? JR: You know, we initially thought it would come after, so we did it and titled it. When we did the record, we decided it did better before it and we just didn’t change the title. [laughs] You know, I think it goes better before as a little more of an introduction. And it’s pretty much the vocal melody of the last tune played on a piano and Peter and I overlayed things like a little horn and some electric guitar. But thematically we wanted to connect that side, kind of have it bee bookended in some way, so the actual tune would be last. But we recorded the song and named it before we made that decisions, so it’s kind of a serendipitous type thing. But I like it where it sits in that order now. AD: You mentioned the idea of you bringing these songs to the people you play with and them filling in around you. How does that play out live? Do you still feel like sort of the center while these players cavort around you? JR: The string parts are pretty much exactly represented from the record. What Heather [Broderick] and Nathan [Crockett] do live is pretty close to what happens on the record. We’ve rearranged some songs, but you know I just play the tunes and I try to keep them as close to the record as possible and not take too many liberties. I enjoy when bands do that, try to recreate the album, but in some ways I actually think that the live show is a different experience than the record. But it’s hard to do everything from the record, but this one was more studio oriented than the first one where we tried to capture exactly what we did live. But I think if you really enjoy a tune from the record, you’ll still enjoy it live, for sure. AD: The new album came out on Kill Rock Stars – they are a label that, if people have been following indie rock for years, they may not really associate with the type of music that you guys are doing. They may associate them with the noisier end of indie-rock, but then again they have been home to Elliot Smith and other people like that. How did you get hooked up with them? Pingback: Thepunkguy » icelandic caves.